My list of restaurants to try in San Francisco is never ending! Al’s Place is a new casual joint that opened a few months ago in the Mission District. What interested me about this restaurant is that most of their menu is produce driven and proteins are served only as side dishes. The majority of their menu consists of small plates so they suggested that each person order two to three dishes. The menu is divided into snacks, cold/hot appetizers, and side dishes. 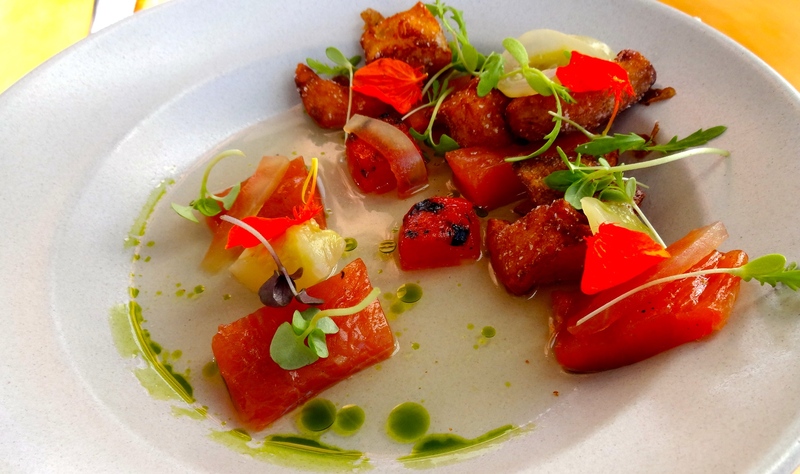 Lightly Cured Trout, Crispy Potatoes, and Melon Gazpacho (8.5/10). Green Pea Curry with Yellowtail and Pickled Strawberry (8/10). 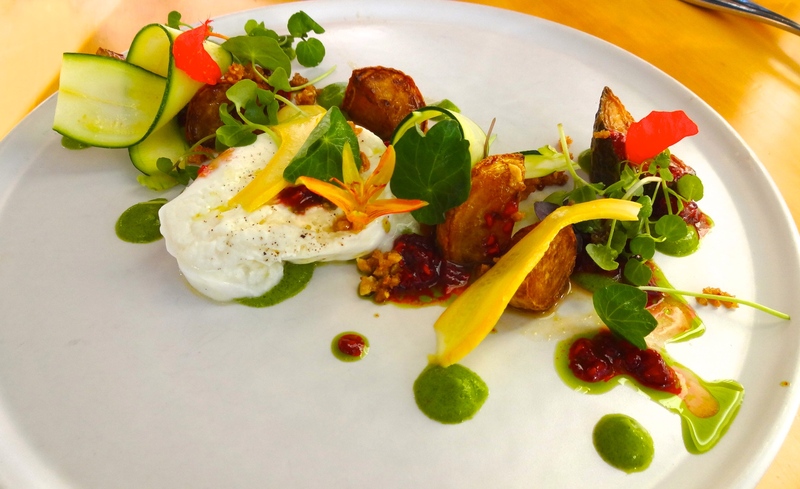 Burrata Cheese with Roasted and Raw Zucchini (7.5-8/10). 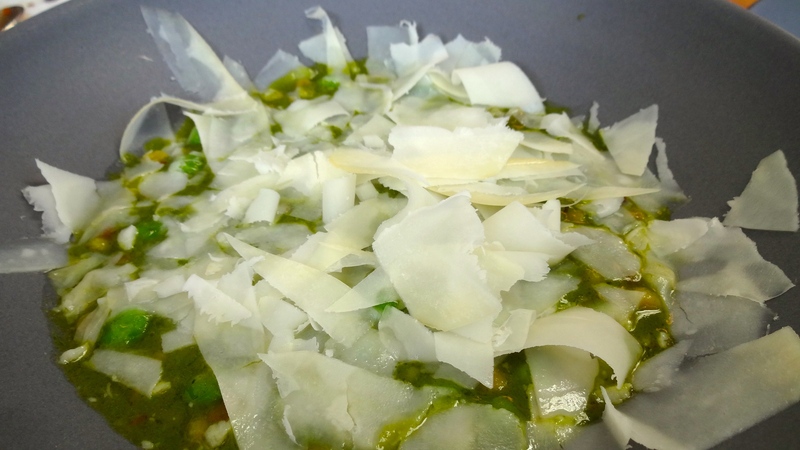 Fregola with Peas and Goat’s Gouda Cheese (8/10). 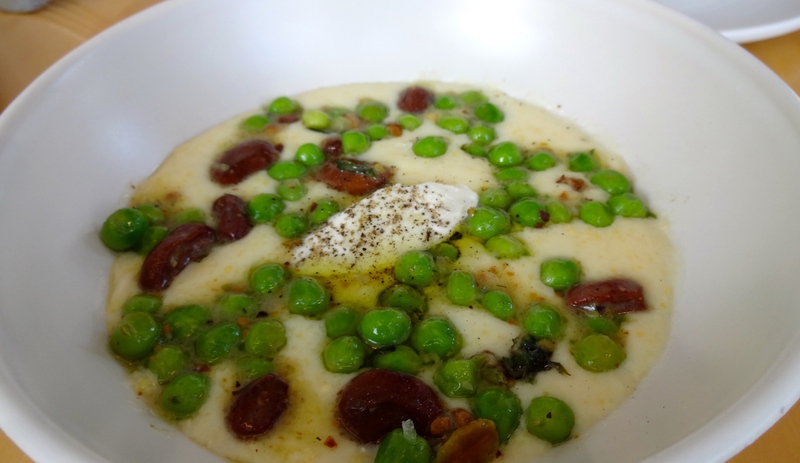 Grits with Peas, Fava Beans, and Goat’s Milk Curds (8/10). 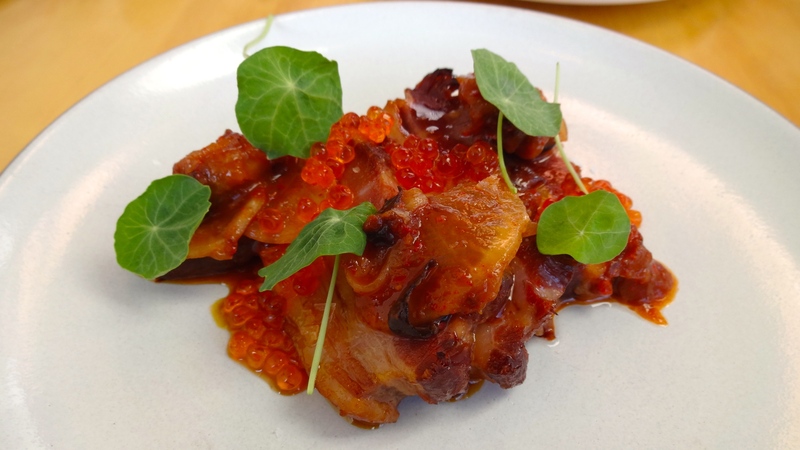 Pork Belly with Trout Roe (8/10). 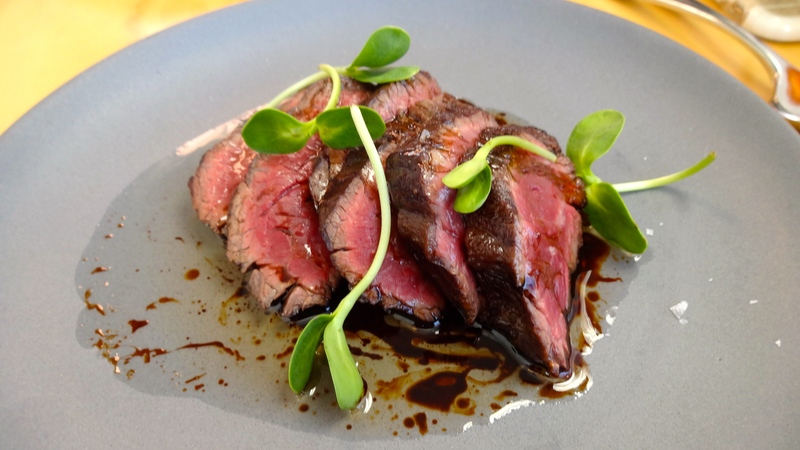 Hanger Steak with Salmon Butter and Sherry Vinegar (7.5/10). 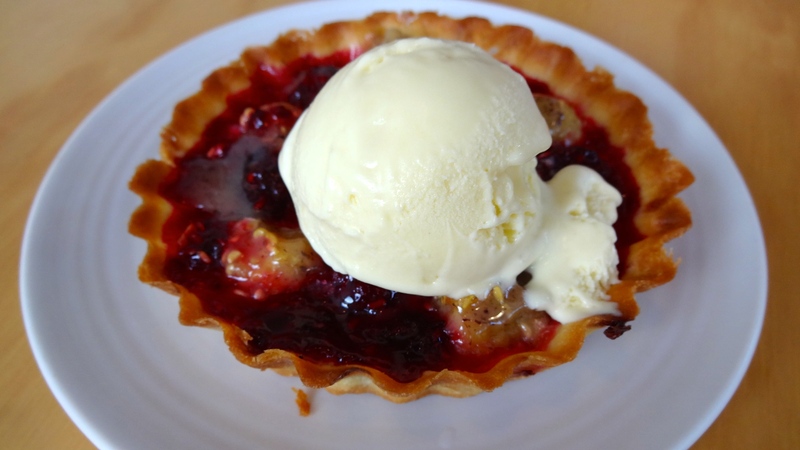 Frangipane Tart with Lavender Ice Cream (7.5/10). 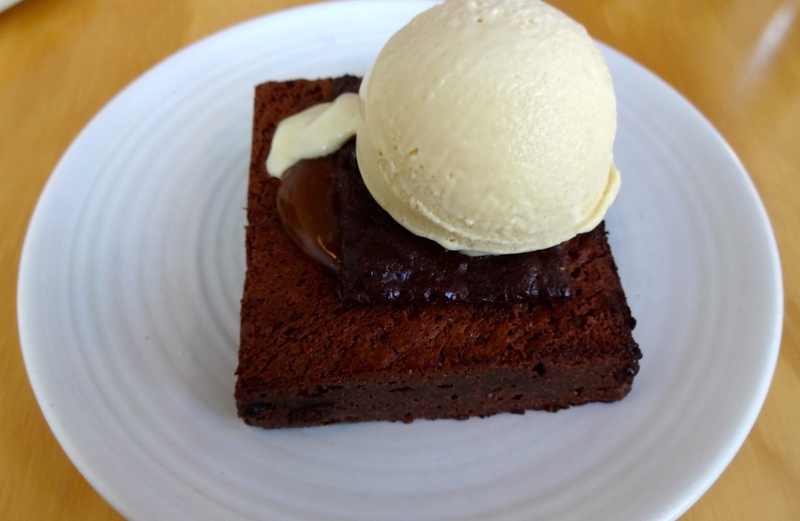 Warm Chocolate Brownie with Peanut Butter Ice Cream and “Pay Day” Filling (8/10). 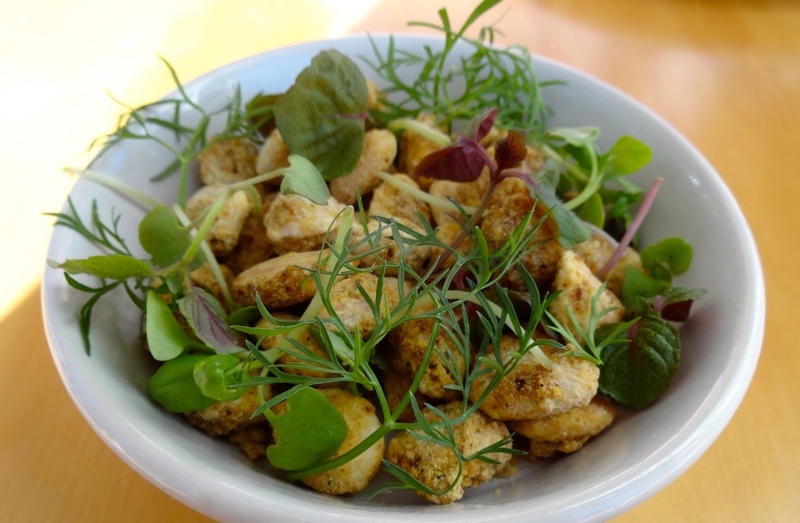 Al’s Place is the perfect restaurant for vegetarians looking for innovative Californian cuisine since majority of their dishes are made of vegetables. I enjoyed that some of the side dishes were meat options so there’s really something for everyone. Some of the highlights of the meal were the cured trout, green pea curry, fregola, pork belly, and warm chocolate brownie. The cured trout was a great way to start the meal, super fresh and summery. The dish consisted of pieces of vibrant cured trout, crisp warm potatoes, lemon cucumbers, and a sweet fragrant melon broth. 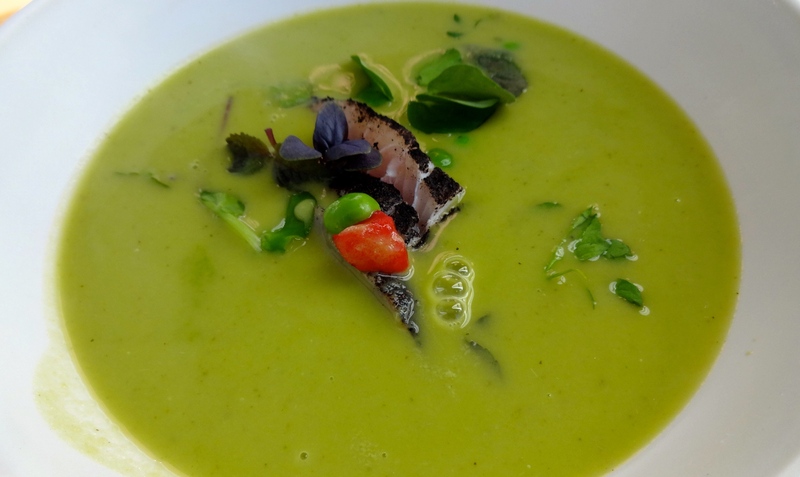 Next, the thai influenced green pea curry was comforting and satisfying with thin slices of yellowtail fish flavored with lime and garnished with pickled tart yet sweet strawberry relish. The fregola, an Italian style couscous, was creamy and rich with pops of brightness from the peas and smothered with shavings of delicious goat’s Gouda cheese. The side dish of pork belly was utterly tender and sweet which paired perfectly with the saltiness of the trout roe. Lastly, the warm chocolate brownie is a must if you go here! The dessert was inspired by the candy bar PayDay with gooey caramel and crunchy peanuts topped with creamy peanut butter ice cream. So good. Al’s Place is a cute restaurant for a casual dinner out to try creative tasty food so I’d rate the restaurant at a 8/10.